i.e. 1 cm on the stress diagram represents 60 MN/m2. The directions of the principal stresses are also obtained from the stress circle. 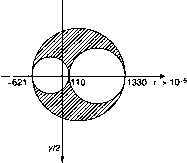 With reference to the 0° gauge direction, o\ lies at 9\ — 15° clockwise cr2 lies at (15° + 90°) = 105° clockwise with 03 normal to the surface and hence to the plane of o\ and cr2. N.B. - These angles are the directions of the principal stresses (and strains) and they do not refer to the directions of the plane on which the stresses act, these being normal to the above directions. The complete Mohr's three-dimensional stress and strain representations can now be drawn as shown in Figs. 8.45 and 8.46. Fig. 8.45. Mohr stress circles. Fig. 8.46. 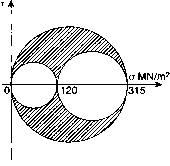 Mohr strain circles. 8.1 (B). Given that the following strains exist at a point in a three-dimensional system determine the equivalent stresses which act at the point. 8.2 (B). The following cartesian stresses act at a point in a body subjected to a complex loading system. If E = 206 GN/m2 and u = 0.3, determine the equivalent strains present. If equilibrium is to be achieved what equations must the body-force stresses X, Y and Z satisfy? Show that, if body forces are neglected, equilibrium exists. where w is the width of the plate. If the length of the plate is L, determine the values of the constants a J? and c and determine the total load on the edge of the plate, x = w/2.